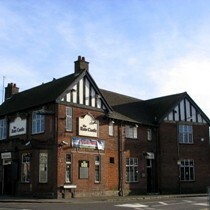 The Rats Castle in St Albans re-opened in August 2007 following a major refurbishment. It is now a smart modern pub with lots of wood panelling and a mix of wood and carpet flooring. Many pubs in St Albans are following the same trend of installing a smart wood interior and new upholstry in the hope of gaining extra customers and maybe customers that are likely to spend more money. However, the danger is that existing regulars will not like their local being smartened up and the traditional drinkers will leave. This used to be a rather basic, somewhat rough, pub but is now a pleasant place to drink. Hopefully the regulars will appreciate the changes and stay. Good value food, both snacks and main meals, are provided at lunchtimes but not in the evenings. Real ale choice consists of Gales HSB and Breakspear Bitter as standard with at least one guest ale provided. Two plasma screens have been installed. These were tuned to Magic TV (mellow music) at the time of the review - it is unknown whether Premiership football will be shown. There's a new wooden decking area at the back which will give the smokers somewhere to go. Overall, the Rats Castle is now a smart pleasant place to drink - it will be interesting to see if the previous locals stick with it or whether the pub attracts new clientel. Range of cask ales now includes Gales HSB, Deuchars IPA, London Pride and Green King Abbott. A pleasant locals pub with friendly atmosphere. A good place to watch the football in comfortable surroundings. Scores updated - old score was 6, 6, 5, 4 averaging 5.5. New average 6.5. "The pub no longer does food at lunchtime. There are 3 large screen TVs showing all major sporting events ( all indoors ). There is live music every Friday evening. The real ales on offer have changed slightly ( there are 4 on offer now ). They have racenights etc. for local charities and also support G.O.S.H. Only 18 years of age and over allowed after 7pm. It is still seen as a local pub by many people old and young."